As summer gets hotter and fall approaches, wasps, hornets and yellow jackets appear in full force. They seem to know exactly when to arrive to spoil your barbecue, picnic or patio use. No one wants to get a wasp sting, and some of us are allergic, so the problem needs immediate attention when wasps appear. Several people in my family are allergic, so we have tried all the tricks to get rid of wasps, hornets, and even start looking into how to keep yellow yellow jackets away. We want to share my best tips here to help others who may be wrestling with these pests. Sweet smelling perfumes and lotions, especially those based on flower scents, attract wasps to you. Avoid wearing these scents when you are outdoors for any length of time. If you seem to attract the pests, or if you are allergic, it is worthwhile to consider wearing wasp repellent the same way you would wear mosquito repellent. You can make your own from essential oils that wasps hate. Spray wasp repellent your clothes and skin every few hours while you are outdoors. This spray is completely safe for children and pets. When picnicking, barbecuing, or just enjoying an outdoor meal, put away all foods quickly. It is tempting to linger over the meal, but the longer the food is out, the bigger the chance of attracting wasps and other swarming pests. Pet foods, nectar, and bird foods can also attract wasps and other pests. Keep this put-away or relegate them to an unused part of the yard. If you like the hummingbird feeder near your window where you can see the birds, be aware that it will also attract wasps. Move it away when using the outdoor space. Decorative wasp decoys can keep paper wasps from settling in your yard. Wasps are territorial and will not move in near another nest. Placing one or two decoy nests around your yard might prevent paper wasps from nesting in the area. This strategy works well if you set the decoys in the spring when wasps are emerging from hibernation and beginning to build their nests. Once the nests are established, it is probably too late. Try again the following spring. Commercial or homemade wasp traps are very useful for catching a solitary wasp. These traps are a good solution if you see an occasional wasp in your area, or for trapping until you can get rid of the nest. You can make your wasp trap from a two-liter bottle. Your aim is to make it easy and attractive for the wasp to fly into the trap, but then make it impossible for him to fly out. By inverting the top of a soda bottle and re-attaching it to the base, you easily draw the wasp into the funnel, but he cannot fly out and there is nowhere to perch in order to crawl out. Set the trap in an area where you have seen wasps or yellow jackets. Once wasps are trapped, discard the entire trap and make a new one. Slow moving wasps resting on your walls or floors can be quickly sucked up with a vacuum cleaner. 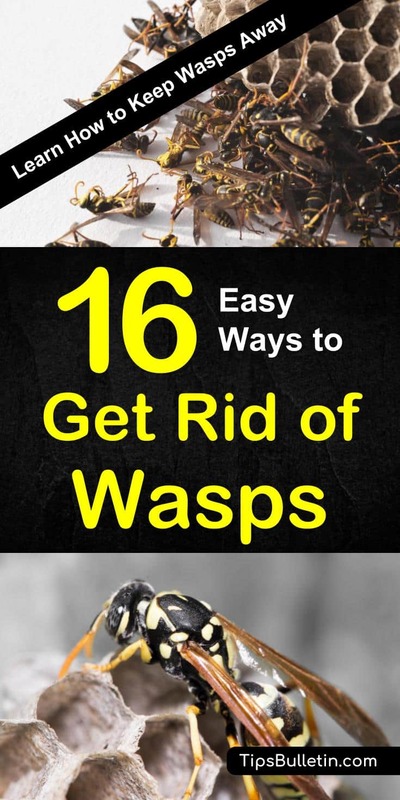 This method works well in the spring when wasps are coming out of hibernation and are sluggish. It is also a very effective method to keep flies away. Later in the summer they are more energetic and may get away. Be careful to avoid a wasp sting. This may seem like strange advice, especially if you have a single wasp buzzing around your home; but dead and dying wasps emit pheromones that attract other wasps. By swatting and killing one wasp, you might attract many more to the spot. It is best to trap the wasp or encourage it to leave the house if possible, then watch for where it returns to the nest. The first step in keeping wasps, hornets, and yellow jackets out of the house is to keep the house well sealed. Check your home for broken panels, holes or loose siding, gaps in soffits, and other crevices where wasps can get in and possibly build a nest. Repair holes in window screens, screen doors, and seal gaps around doors and windows. Prevent a wasp, yellow jacket or hornet nest by being proactive. Yellow jackets and some other paper wasps build nests in holes or existing burrows in the ground. Check your yard for existing rodent holes and tunnels where they might find a home. If you see these wasps flying around your yard, watch to see where they nest. Don’t approach the nest until you are ready to eliminate it or you could end up with some nasty stings. See below for information on how to eradicate this type of nest. Wasps are attracted to flowers and sweet-smelling plants, while other scents repel them. Use repellent plants in your garden, especially close to the house. These will not only work to repel wasps but also keep mosquitoes away. You can plant them in among your flowers or vegetables, create a separate herb garden, or plant them in containers on your patio. Use care when using wormwood. This boxy shrub is poisonous to people, small animals, and surrounding flowers and plants. It does an excellent job of repelling wasps, but might not be a good choice if you have pets or small children around. Find the nest by watching the wasps for a few minutes to see where they are entering and exiting. Do not approach the nest until you are ready to spray it. Wait until early morning to spray the nest. All the wasps will be asleep inside, and you will get as many as possible this way. They begin to become active around 8 am, so prepare to spray well before 8, preferably at the crack of dawn. Have two full cans of commercial wasp spray ready. Aim the first spray at the main opening, usually near the bottom of the nest. Spray a steady stream of wasp spray for at least 10 seconds. Then spray the secondary openings for as long as possible. Quickly leave the area and take refuge indoors if you see any activity or when you have used all your spray. Watch the nest for activity, from a distance. If wasps continue to enter and exit during the day, repeat the spraying the next morning. Be careful to follow these instructions carefully so that you don’t get stung. You want to spray the nest at night or in the early hours of dawn when the wasps are asleep. Do not try this during the day when the wasps are active. Wear protective clothing and prepare your exit path ahead of time. Locate the nest during the daylight and mark it so you can find it in dim light, but wait until the middle of the night or very early morning to treat it. Mix a 1/4 cup of dishwashing detergent in a large bucket of water. Pour the soapy water into the hole or burrow and cover the hole with the upended bucket to trap any wasps that try to escape. Leave the bucket in place for several days to make sure all wasps are dead. The last thing you need when driving is to have a wasp attack. Fortunately, this is easy to prevent. If wasps have found their way into your car, place some fresh spearmint leaves or some mint tea bags in the car and leave the windows open so the wasps can escape. Replace the mint whenever the scent dies down, and this should solve your wasp problem in the car. If the wasps do return, look under the hood and under the car to determine whether they have made a nest somewhere inside or nearby. Hopefully, these tips will help you eliminate wasps for good. If the problem continues, find the nest and eradicate it. Be especially proactive in the spring, before the wasps have established their nests for the year. Once the nests have been built, you may have to kill the nest to get rid of the wasps. Following the tips above will help you keep wasps away from the patio or deck. A combination of strategies is useful and usually more effective than any single method. If you are seeing many wasps, find and eliminate the nest. Keep your patio clean and avoid any food leftovers laying around. Otherwise, avoid attracting them and use a trap to catch those that do come buzzing around. 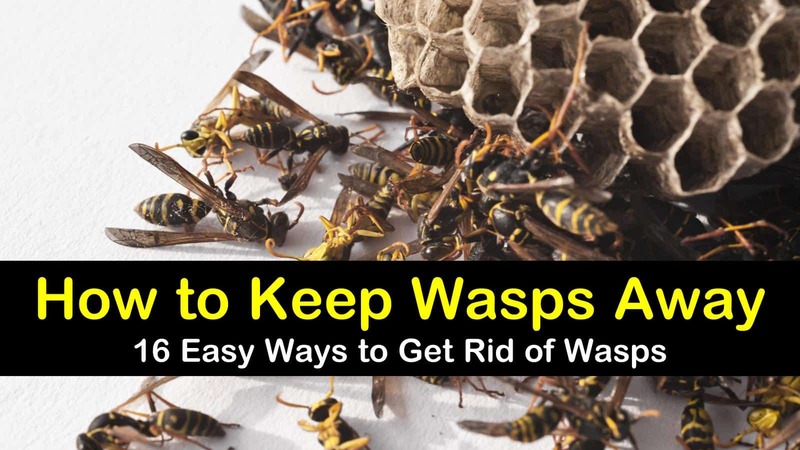 Let me know how these tips work for you, or if you have additional ways to get rid of wasps.I’ve tried to be thorough here and list all the methods that have worked for me, but I’m sure there are other methods that also work. If we all help one another, we can solve these kinds of problems. Spread the word by sharing this article on social media so that others can find it easily. Good luck in your war on wasps.